I bought 18 boxes. It’s not enough. It’s taken 12 for the living room alone. My best guess is that it’ll take 6 more for the kitchen, and Lord only knows how many containers it will take to wrangle all the contents of my bedroom closet. But then that’s it. It will be done. I will have packed away all of the things in my life. All that will be left are my fears and ambitions; the time I’ve whiled away and the time I have left—as empty and full of potential as all the unfettered space remaining in my apartment. I’m not moving; I’m just packing. The idea came from a blog post written by the current sweethearts of Minimalism, Joshua Fields Millburn and Ryan Nicodemus, who maintain a blog called simply “the minimalists”. As men of great ambition Joshua and Ryan threw themselves with the full force of men on a mission to become the penultimate minimalists. Unlike myself, though, they strike me as the kind of men who do not fear failure because they are wholly unfamiliar with it, the golden boys for whom success flows like ambrosia out of the ewers on Mount Olympus, the kind of success reserved only for Gods among men. I am, perhaps, as ambitious as these men, but I am no God(dess)—among the masses of humanity which populate this earth, this nation, this city, or even the 10 units of my apartment building. I am merely a human prone to error, more akin to Sisyphus in my perpetual toil than to Athena or Aphrodite. I make mistakes every day, step backwards from my goals—be they ambitious or simple—but for as many steps back as I take, there are enough steps forward to get me slowly closer. In this current endeavor (what the minimalists coin a “packing party,”) I am not so foolhardy as to ignore what I know about myself—namely that change makes me extremely uncomfortable. But I want to make changes in my life. I also want them to be sustainable; and in order to do that I need to do as much as humanly possible to put the odds in my favor, which means avoiding quick decisions that are not well-thought-out, lest my latest attempt at change end in bitter regret and more longing than when I began. I’ve been thinking about this project for months, now, ever since I read that blog post. And I think I can do it, as long as I set realistic goals. The goal with my box project is simply to gain some self-knowledge. What can I really live without? 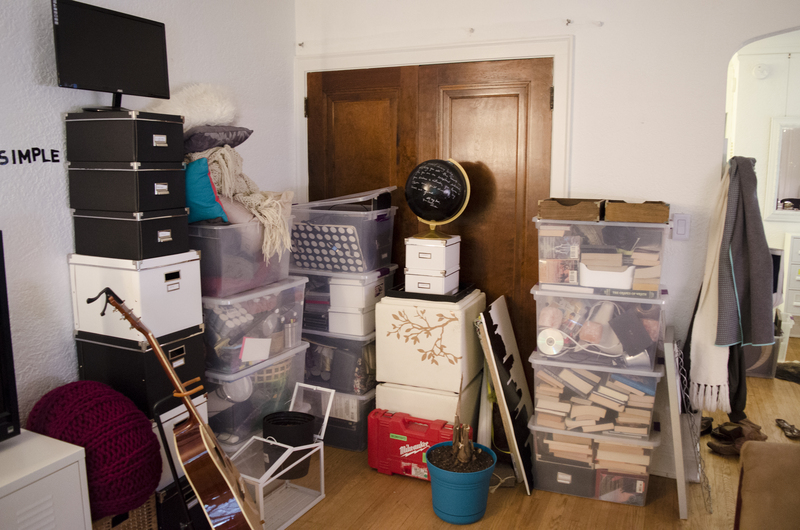 Can I be happy without the safety blanket that is my 20 to 30 boxes of stuff? I intend to live out this project for one month, slowly unpacking not just the necessities but also the indulgences so long as I use them at least once. I will very seriously consider getting rid of the things that are left in those boxes at the end of the obligatory month, but I have made no commitments yet. I hope that this act of putting my stuff in boxes is a turning point. It is taking action where before I was paralyzed by anxiety and uncertainty. It is trying something out that has no guarantee of success; the truth is that I might give up tomorrow and that’s okay.